One of the prestige brands in the world of single malt whisky is The Macallan. They have managed to build up quite a reputation and people are willing to pay good money for a bottle of Macallan. Not so many people know that The Macallan is also used in the Famous Grouse, a well respected blended whisky. 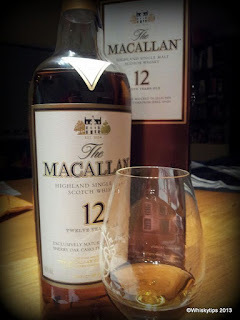 Last week we came across a bottle of Macallan 12 year old, matured in Sherry Oak Casks from Jerez, in the south of Spain. Now, maturing in sherry casks will tell you something about the taste to be expected. Usually: sweet, cinnamon, nutty, chococalate, sherry of course, dried fruits, stuff like that. That doesn't make a sherried whisky a good whisky at once. Thing is that, unlike the seventies and eighties, sherry isn't that popular anymore. That itself is a pity: just treat yourself to a good bottle of sherry and you will fully understand what we are talking about. Just ask you local wine merchant. Since less people drink sherry, there are simply less sherried casks available. Within this limited stock of casks, it is the challenge for the whisky producers to find the best barrels. Especially those ones that haven't been sulphured badly, which is by far the biggest risk fail for sherry casks. The Macallan is one of the brands that carefully select the casks, for Scotch stills goes very well in sherry casks, allthough most of the malt whisky these days is matured in bourbon casks (and makes very good whisky as well for that matter). We came across this bottle during the "Wild Whisky Weeks" at the Gall & Gall, a large chain of liquor stores in the Netherlands. Price was € 37. Normally a bottle like this will cost you around € 50. To be honest: the bottle was opened and tasted upon the day of purchase. Result was that we went straight back to the shop next morning to get an extra bottle, since this bottling is in stock for only a limited time. Because of its reputation and quality, the Macallan is a whisky that's victim of imitation. To ensure customers they buy the real deal, Macallan seals their bottles with a special green hologram (see pic.). The hologram depects the Easter Elchies House, built in 1700, that, according to the Macallan, is their "spiritual home". Conclusion: If you like sherried whisky, this is a well balanced whisky for you. Of course, an older sherried whisky will give you more complexity than this 12 year old, especially if you let the older one rest in your glass for a while. But you will pay a lot more and this is just a very tasteful example of how whisky in sherry cask matches, already at a relatively young age.